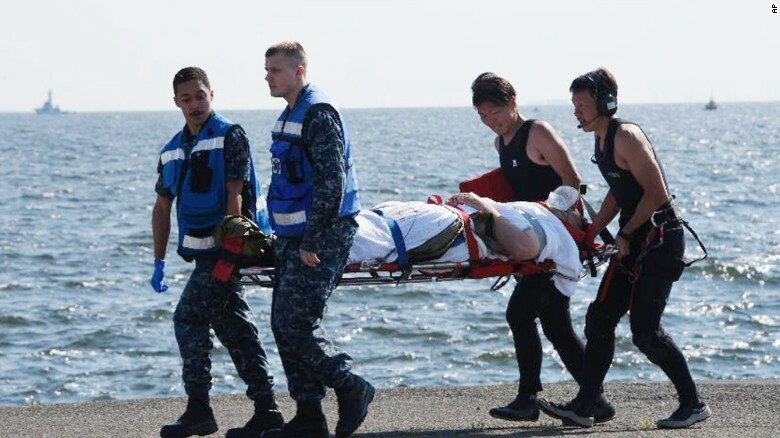 Seven sailors are missing and three injured after a U.S. Navy destroyer collided early on Saturday morning with a Philippine-flagged container ship south of Tokyo Bay in Japan, the U.S. Navy said. The Japanese Coast Guard said the destroyer was experiencing some flooding but was not in danger of sinking, while the merchant vessel was able to sail under its own power. The U.S. Navy said in a statement the USS Fitzgerald, an Aegis guided missile destroyer, collided with a merchant vessel at about 2:30 a.m. local time (1730 GMT), some 56 nautical miles southwest of Yokosuka, a rare incident on a busy waterway. Three aboard the destroyer had been medically evacuated, including the ship’s commanding officer, Cmdr. Bryce Benson, who was reportedly in stable condition after being airlifted to the U.S. Naval Hospital on the Yokosuka base, the Navy said. The other two injured were transferred to the hospital to treat lacerations and bruises, it said. The Fitzgerald, the Japanese Coast Guard and Maritime Self-Defense Force were searching for the seven missing sailors. “The USS Fitzgerald suffered damage on her starboard side above and below the waterline,” the Navy said in a statement. The full extent of damage to the ship and injuries to its crew were still being determined, it said, adding that the Fitzgerald was operating under its own power, “although her propulsion is limited”. The ship, part of an eight-ship squadron based in Yokosuka, had in February completed $21 million worth of upgrades and repairs. Instagram Funny Memes That Are Totally Relatable!